We all need a break from the hustle and bustle of the day-to-day. But knowing exactly how to relax is a whole other story. Is it a massage, a glass of wine on a patio or by a fire, a locally sourced chef-prepared meal? Or is it a quick getaway for a change of pace and scenery? Luckily, a day at the spa and an out-of-town getaway don’t have to be mutually exclusive! Whether you’re heading out of town with a bridal party, on a mother-daughter trip, as a couple, with friends, or even on your own—there are plenty of resorts in Ontario just right to soothe your mind and body. If relaxation and wellness are what’s needed on your next vacation, you’re in luck. We’ve chosen some of the best of the best that the province has to offer. Stay in a waterfront cottage on Rice Lake and enjoy a tutored wine tasting and farm-to-table meals. Horseback trails and chartered floatplanes make this spot unique. The Spa at Elmhist uses ARBONNE natural products and offers services to women and men, including massage, reflexology, and aromatherapy. Check out their wellness packages for the perfect gift or getaway. Elegant yet rustic, Milcroft Inn & Spa in Caledon offers fine dining, fine wine, and a true retreat from the every day. If you’re looking for a fun wellness getaway, consider making use of their bike rentals, outdoor yoga sessions, or variety of other activities. Set against lush greenery (100 acres of protected woodlands) and Shaw’s Creek waterfalls, the on-site Headwaters Restaurant builds its menus around the availability of locally sourced organic foods for ultimate freshness. A boutique resort experience for two! As the name suggests, this resort—the only 5-star resort in the area—is exclusive to couples. Each suite and cottage includes a Jacuzzi, hot tub, and wood-burning fireplace. A popular spot for honeymoons and anniversaries, Couples Resort has spa services that allow you to really pamper yourselves. Registered massage therapists are available, as is reflexology, hot stone therapy, and more. Mani-pedi and waxing are also available. Six treatment rooms are available on-site, and many services can be done in your suite (depending on its size—inquire about this option when booking). Enjoy all that Algonquin Park has to offer, a spot on a semi-private lake, and five-course dinners all while connecting or reconnecting with your special someone. The Niagara-on-the-Lake area is a top resorting destination for a reason. Whether you’re in town to golf, tour wineries, take in some theatre, or explore the outdoors, Pillar and Post offers an ideal home base for your trip. Visit the 100 Fountain Spa—13,000 square feet of luxury, health, and relaxation. The spa menu includes a variety of classic and exclusive services, including services specific to men and youth. Signature services include Vinotherapy (a beauty treatment involving the same ingredients as wine-making with anti-aging effects), and body treatments incorporating teas and botanicals. Group bookings are welcome; you can also opt for a couple’s massage suite for extra privacy. 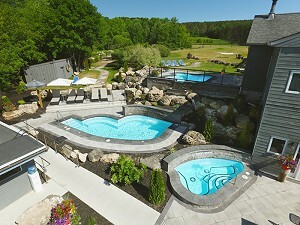 You’ll also want to experience the outdoor hot springs, organic treats from the spa menu, and a heated outdoor pool. This five-star country inn offers fine dining on their poolside patio, a wine bar, and contemporary comforts in each room (deluxe, hypoallergenic bedding included). Rustic, lavish, and walking distance from the local attractions—Pillar and Post is where you want to be. Find this year-round heritage resort right on Lake Simcoe. A short drive from Toronto (and shorter drive from Barrie, Newmarket, and the surrounding area), this spot, in their own words, “captures the traditional warmth of a country inn with all of the benefits of an extensive lakeside Ontario resort.” Guest rooms, lodges, and cottage options are all available for your stay. While the spa is open for day visits, an overnight stay gives you access to the many activities and amenities The Briars’ Resort & Spa offers, including paddle boarding, tennis, golf, gardens, a library, sauna, games room, and more. The spa menu offers an array of high-quality treatments including Swedish massage, skin care, hydrotherapy, and holistic treatments, with a focus on relaxation and rejuvenation. Overnight packages and monthly specials are available. 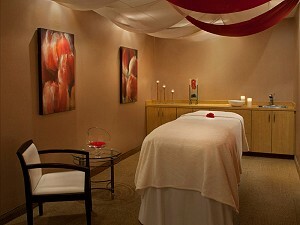 Inquire about the Briar’s Best Spa Membership for frequent spa-goers and book some regular you-time into your schedule. White Oaks is five-star resort and hotel, popular as a wedding and conference venue. This modern option is set on 13 acres in Niagara’s wine country, and hosts a state-of-the-art fitness club, offering personal training, racquet sports, yoga, and much more. On-site dining options, Liv, Play, and Grow, offer the best of all worlds: casual, fine dining, and health and sustainability. Make time for your mind and body to let go at The Spa at White Oaks, where 19 treatment rooms—including a couples’ suite—are available. De-stress, cleanse, re-energize, and shine with the many available treatment offerings. Mother-daughter time, a sweet solo getaway, or a weekend out of town with friends are all well spent here—there’s likely even a package to accommodate your party’s needs. You’ll also want to check out the Zero Nine Five hair salon, and the “Spascription” program, which sends you home with the beauty products best suited to make your spa experience last. Ask about the spa’s loyalty program if you plan on being a repeat guest. Blue Mountain Resort is best known as a family-friendly ski and snowboarding destination, but it truly has it all, regardless of the season you visit in. Whether you’re looking for sport and adventure, a weekend away with your significant other, a chalet by the fire, or a place teeming with dining and shopping options, you’ll find it at Blue Mountain Resort. 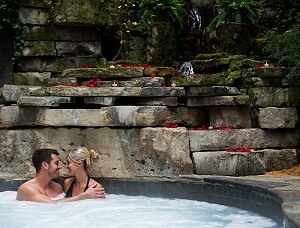 Blue Mountain Resort is home to three spas, Iwa Spa, Kalola Life in Balance Spa, and Scandinave Spa Blue Mountain. Iwa is a wellness spa in the Blue Mountain Village offering massage, reflexology, and restorative yoga, as well as facials, manicures and pedicures. Thai yoga massage and Tibetan sound therapy are among the more unique offerings. Iwa specializes in Ganban volcanic rock therapy—a rock sauna with many health benefits, including boosting immunity, pain relief, and reduced insomnia. 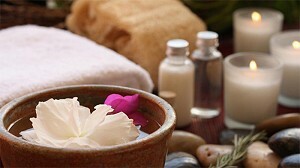 Kalola Life in Balance Spa focusses on the natural world. Their offerings promise to improve your mood, focus, and connection with nature. Traditional and alternative practices are used here to maximize health and vitality. Beauty, balance, and renewal are all at the core of Kalola’s vision. Scandinave Spa Blue Mountain may be the most talked about spa at the resort, as it is known for its luxurious Scandinavian baths. This award-winning spa is unique in its heat and hydrotherapy options. Its extensive water circuit includes thermal and Nordic waterfalls, hot baths, and cold plunges—as well as Finnish and infrared saunas and eucalyptus steam room. The spa is set in a unique natural setting with stunning views you must see to truly appreciate.